More often that not, Windows 10 can get a bit hungry for Windows updates. When this happens, you can kiss all your work goodbye. This is because, once the updates are installed, it is certain that in the upcoming hours, Windows is going to forcefully restart itself. This happens even when you set the active hours according to your liking. For someone like me who doesn’t really like to restart their whole PC for an update, this is utterly annoying. Granted that some of are a bit stubborn when it comes to restarting Windows, but still, restarting is annoying. The updates will always remain pending if we don’t restart. Luckily, there is a fix for this! There is an app called the shutdownBlocker. As the name suggests, this will allow you to circumvent the forceful behavior of Windows regarding the updates. How this app works is quite simple. But, rather than reiterating what it does, I’ll just quote what is written in the readme file itself. It works by registering a ShutdownBlockReasonCreate() reason and objecting to WM_QUERYENDSESSION messages. It can optionally be set to consume all calls to shutdown.exe and MusNotification.exe (among other things, this blocks Windows 10 Update restarts); but this requires running the app as an administrator. A full rundown on how this stuff works is below the changelog. As you can see, what is happening is that this app is blocking the shutdown.exe file which is responsible for restarting and turning off your PC. By blocking any process from accessing it, the habit of Windows 10 restarting itself can be worked around. Be aware, that for the app to work, it needs to always run as administrator in the background. Let’s go with the procedure for configuring the app. Download the shutdownBlocker app zip on your PC. In the zip file, there are two files: Readme.txt and the shutdownBlocker.exe file. Extract the two files in “C:\Program Files (x86)\shutdownBlocker“. Once that is done, right-click on the shutdownBlocker.exe file and select “Run as administrator“. Accept the UAC prompt. In the main app screen, you will see two large buttons: Block and Allow. These buttons can be used to block/allow the shutdown.exe file from being accessed (sort of) as quoted above. But, first, click on the Settings button and check the “Start with Windows“. This is to ensure that you won’t ever have to manually open the app yourself. If the app is not constantly running in the background, it won’t work. Now, click Ok to go to the main app. In the main screen, click on Allow button. 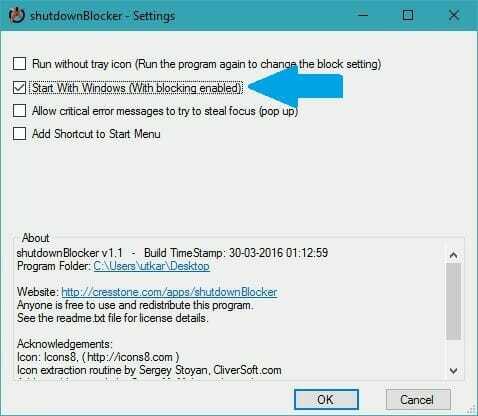 This will start the blocker service which will stop Windows from restarting itself automatically after the updates. One more thing to note: If any task triggers the reboot task, then the shutdown blocker won’t work. For this, you will need to enable the option to intercept the shutdown.exe and MusNotification.exe files. You can enable this option in the main screen of the app.